News: Japanese architecture studio SANAA has won a competition to design the Taichung Cultural Centre in Taiwan. 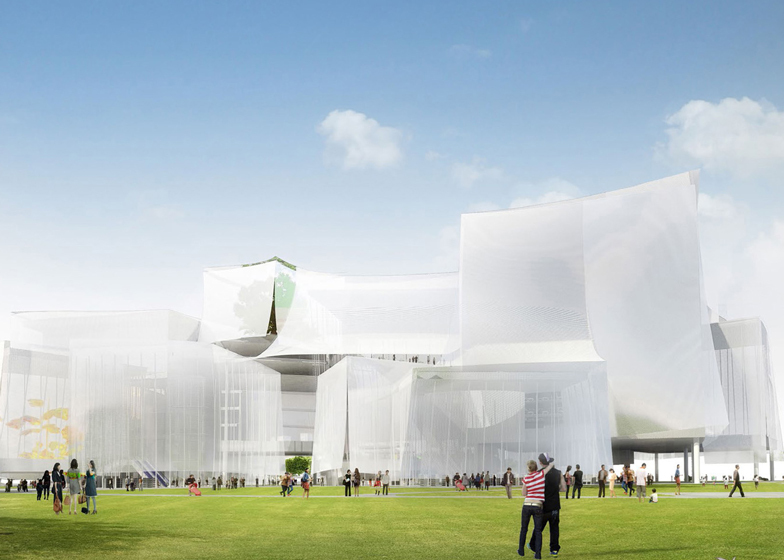 SANAA's proposal for a stack of warped cuboids beat proposals by international firms including Eisenman Architects of New York and Mass Studies of Seoul. Translucent mesh will be draped from the edges of the roofs to create curving curtains around the buildings. The cuboids will sit at angles to one another and overlap at the corners to link exhibition spaces, libraries and reading areas within the new Taichung Cultural Centre. Visitors will enter through a large plaza beneath the volumes in the centre of the complex. Inside there will be three main storeys interspersed with mezzanines. A spiralling ramp will connect private study areas piled on top of each other around the sides in one of the largest spaces. The offset volumes will create large covered outdoor spaces and roof terraces, providing seating areas for cafes. SANAA recently presented designs for a new campus for Israel's leading design school and is shortlisted to design a new headquarters and visitor centre for the Nobel Prize in Stockholm. Beijing architects MAD have designed a convention centre for Taichung, while Stan Allen constructed a pavilion of bamboo scaffolding at a former airport in the central Taiwanese city.